Home / 4 Stars / Articles and Stories by Njkinny / Articles by Njkinny / Product Review / Received for Review / Household chores? Men #ShareTheLoad! Are household chores only a woman's job? While I have heard and seen on TV that women are taught that household chores like cooking, cleaning, doing laundry, looking after the children etc. are all women's job but thankfully, I have been blessed with a family where our men work alongside the women. They #ShareTheLoad happily and it isn't something that seems out of the ordinary here. Ever since my childhood, I had seen my father and grandfather helping in the work at home. My father packed my tiffin, my grandfather was always ready to bathe me and even cooked when my mother or grandmother were busy with some other work. So I always took such occurrences of men working at home: cooking, cleaning and doing laundry very naturally. Then I grew up and realized that what I saw as natural was something that was very unique to my family. The TV shows, movies, books and even friends didn't have this equality between men and women when it came to household work. There the women were implicitly taught that all house work was their responsibility and not something that men did. Ever! We claim we are modern. Women have excelled in every field and our leaders preach of gender equality but have you seen the actual statistics? The stats are very shocking. 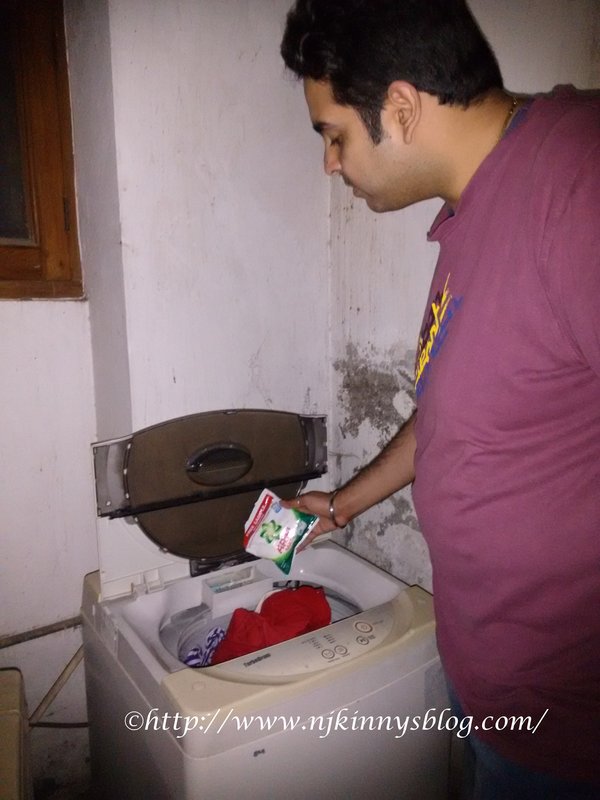 When I heard of the #WashBucketChallenge on Blogadda in association with Ariel, I was ready to join this movement and through my post try and motivate men to help their wives, sisters and mothers in their household chores. I and my husband have divided the household work between us. Some days he cooks while I clean the house and do the laundry while other days I cook and he does laundry and the cleaning. 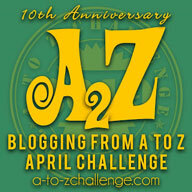 I didn't tell my husband about the challenge and waited for his turn to do the laundry. "Nikki, why such a small pack? We always buy a bigger one, na." My husband asked me as soon as I entered the back area where our washing machine is kept, a few seconds after he had entered with the dirty clothes to start on the laundry. "Oh! 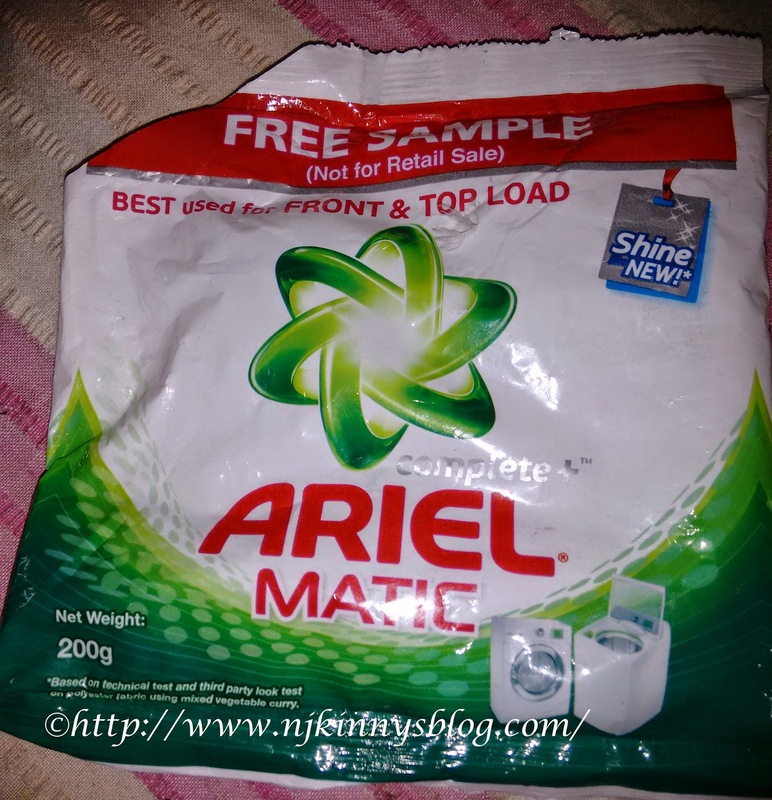 I didn't get the big pack of Ariel anywhere but managed to buy a small one. " I answered breezily, not wanting to tell him about the movement as yet and that I had received the small pack as part of the movement. The Ariel pack I received as part of the challenge. "Okay." He said and started to take out the scissors to cut the pack open. "Wait. You help me so much that I want to click a few photos with you helping me do the laundry. I want to show the photos to a friend who didn't believe me when I told her that you were cool with helping me at home." I told him, hoping he bought my excuse. I was shocked at his rapid agreement, since he is camera shy and doesn't like getting his pictures clicked much, but then briskly recovered and we were great to go! 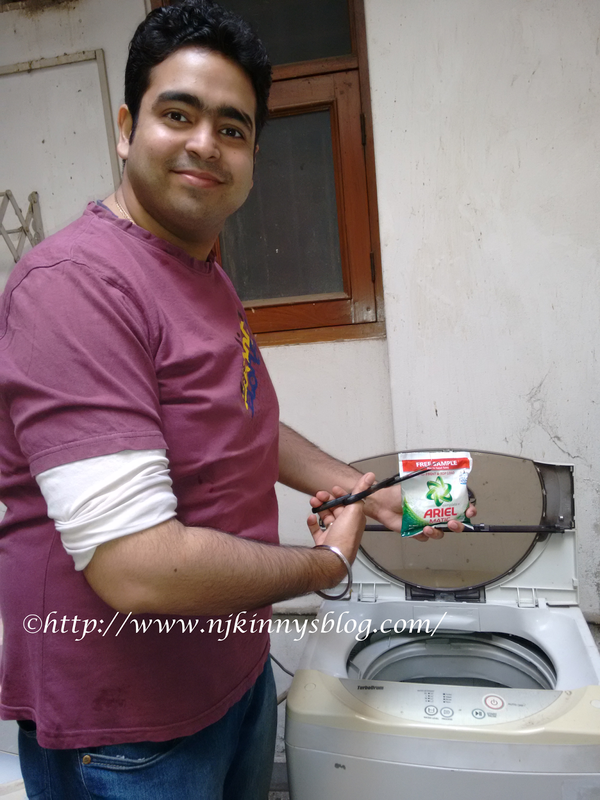 My man does the laundry with a smile and is happy to #ShareTheLoad! He is dedicated towards his responsibility to our home and even does the laundry in all seriousness. I clicked his photos doing the laundry and all the while smiled thanking God for giving me such a loving and understanding husband who is always there to help me. After the photo session, I sheepishly told him about the #WashBucketChallenge - #ShareTheLoad challenge and recalled the ads we had seen on TV and how I had participated and his photos would be used for writing a blog post. He smiled and said, "No problem. I hope all men understand that house work is not only a woman's responsibility but also a man's. True happiness and satisfaction is possible only if we #ShareTheLoad with our wives, mothers and sisters." His understanding and support makes me thankful each day and I hope all men understand that men and women are equal and this equality is valid even at home and even for the household chores. I hope my post motivates men to help women in their household work and thus, #ShareTheLoad. I also nominate these five friends to take the #WashBucketChallenge challenge and inspire men to #ShareTheLoad!